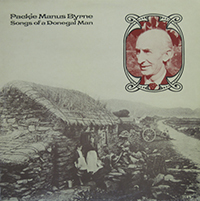 PACKIE BYRNE was born in Co. Donegal in 1917 into a community where traditional music and song were deeply imbedded, Packie could not help but continue this tradition. Throughout his life he was a notable singer, also becoming very well-known in the London area as a whistle player of great skill. This album shows a less well-known side of Packie – a carrier of fine traditional ballads, some of which were quite rare.